This blog tells the story of a year-long trip around America's Great Loop. 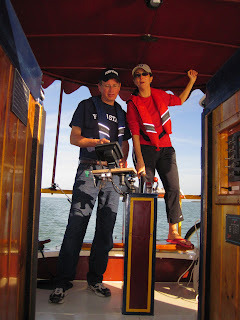 With less than a week's experience piloting a powerboat, education professor Bill Carlsen and his wife, science writer Cynthia Berger, set out to circumnavigate eastern North America in an old-fashioned canal boat retrofitted as a solar hybrid vessel. The boat's top speed is 6 mph, hence the name SlowBoatCruise. 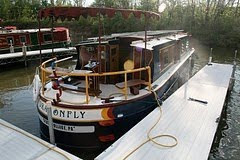 The couple launched their "voyage of sustainability" on the Erie Canal in upstate New York. To read their blog posts in order, starting from the beginning, click HERE. Bonus photos are posted on the SlowBoatCruise Facebook page. The SlowBoaters are available for talks and slideshows about their voyage. Themes include Sustainable Technologies, Environmental Issues along America's Waterways, The Great Loop, and Canals of Eastern North America. To request a presentation, send email to cberger@nasw.org.